Modera Mosaic apartments in Fairfax, VA provide a picture-perfect backdrop for your lifestyle in the heart of the upscale Mosaic District. The building’s contemporary architecture featuring clean lines and brick and metal paneling is a place you’ll be proud to call home. Check out our photos, videos, and virtual tour to see details of the apartment finishes and layouts. Imagine how your furnishings will fit into each apartment. Choose which floor plan of a one- or two-bedroom apartment or a studio design will best meet your needs. Catch the view of how our community amenities — a clubhouse, resort-style swimming pool, gaming area, and fitness studio, to name a few — expand your living space with options for exercising, relaxing, and entertaining, all within a pet-friendly community! Use our interactive map to find your favorite dining and entertainment venues, plan your route to school or work, and find the best places to get other services. 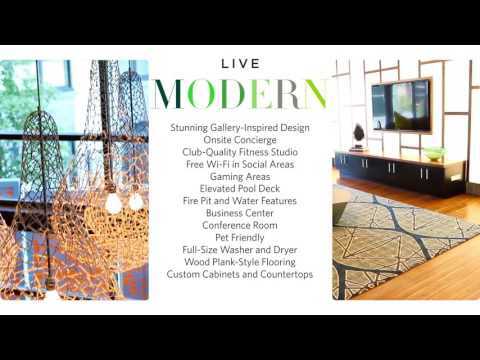 Contact us today to set up a personal tour or simply choose your Modera Mosaic apartment and apply online. New Homes - Now Leasing! Expansive resident clubhouse with free Wi-Fi. Convenient entertainment kitchen and dining area in our clubhouse. Elevated sundeck with lawn area and cabanas. Resort-inspired pool deck with luxury cabanas. Steps from restaurants, retail and more. Cozy resident lounge with flatscreen TV. Plenty of options for entertaining or relaxing. Various social lounges on our elevated deck. Outdoor fire pit and views of Mosaic District. Oversized windows offer plenty of natural light. Game tables, abundant seating and flatscreen TVs in our resident clubhouse. Indoor/outdoor lounge space in our clubhouse. Outdoor grills and dining lounge. Lounge or relax on our elevated sky deck. Unique and modern floor plans.